Beef Brisket – Gastronomy and Magic Collide | I Am Too a Food Aficionado! If you’re really lazy and don’t want to take the time to read the fantastic detail below, here’s the Executive Summary: The ultimate brisket is prepared with two crucial elements: smoke then steam. Overall, in life, I believe I have lofty goals. 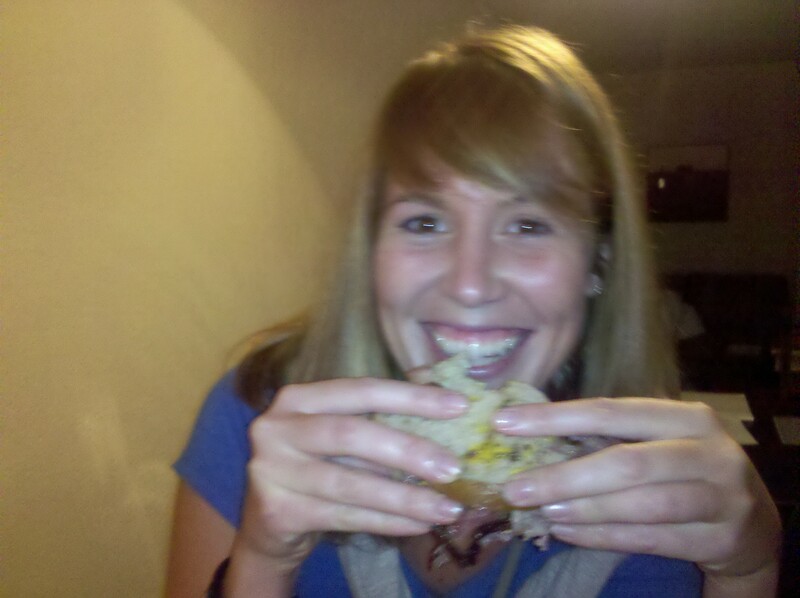 My goal this week was to learn how to make an authentic Montreal Smoked Meat sandwich. The key to a good smoked meat sandwich is, of course, the Beef Brisket – and ensuring that the brisket is succulent, smokey, juicy, tender, melt in your mouth delicious. Remember, the goal of beef brisket, is taking a cheep, rather difficult-to-deal-with cut, and turning it into a delicacy (kind of on par with turning water into wine). This is not a task to be taken lightly. I’ve heard endless horror stories about overcooked, tough, dry results – turning your Friday night Shabbas dinner into a silent gathering. The following steps, after exhaustive research and time in the Marina Del Rey test kitchen, are deemed the optimal way to turn out a great brisket. 1.) 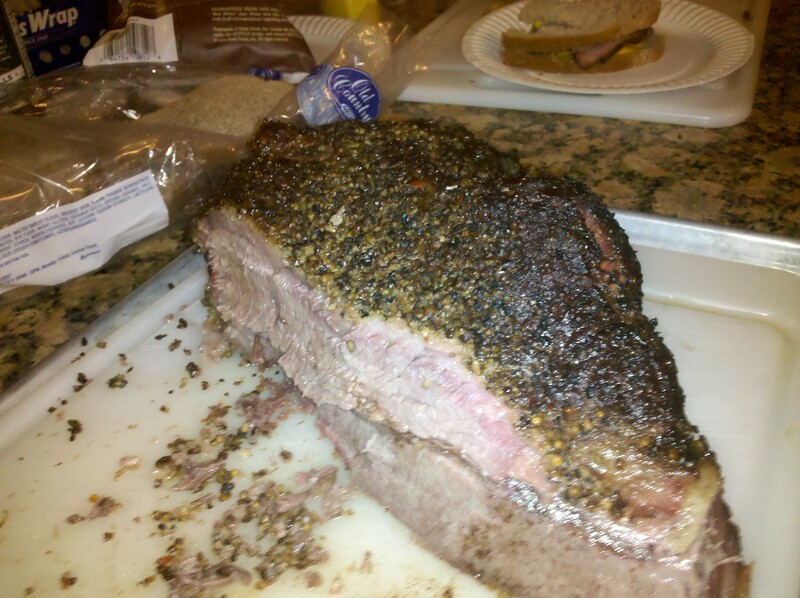 Purchase a 10 – 12 pound brisket with fat cap on. The counter guy I questioned at Schawrtz said “get a soft breast piece”. I went to Smart and Final and paid $1.99 per pound and selected a nice twelve pounder that was fatty on top and soft when pressed. 2.) About a day or two before cooking take the brisket out of the package, do not wash the blood off, coat thoroughly with garlic, crushed peppercorns, rock salt, chili peppers, cumin (its your basic steak spice, nothing revolutionary). Don’t pinch the spice on, dole it out by the fistful. Cover, and place back in the refrigerator (duh). 3.) The cooking process is two pronged (smoke, then steam). First step, it’s all about the smoker. I used hickory wood chips, on my electric Brinkman smoker. I don’t use any liquid in the drip pan (other than one measly Tecate beer); fear not hydration is step two. Place the meat on the top rack FAT SIDE UP – no need to turn the meat throughout the entire process (key point). I left the brisket on the top rack for about 4 hours. 4.) After four hours (try not to lift the lid on the smoker too much), your brisket should now be dark red-ish, a tiny bit of char, and firm, and fairly cooked…but were you to cut and eat at this stage, it would not be a good result. 5.) 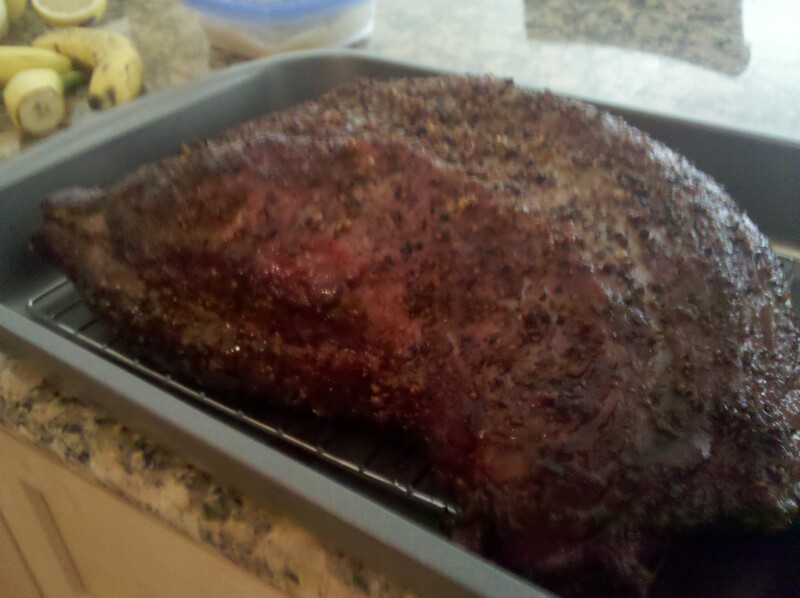 Amp-up your indoor oven to 225 degrees (f), and put the brisket in a pan with three cups boiling water. 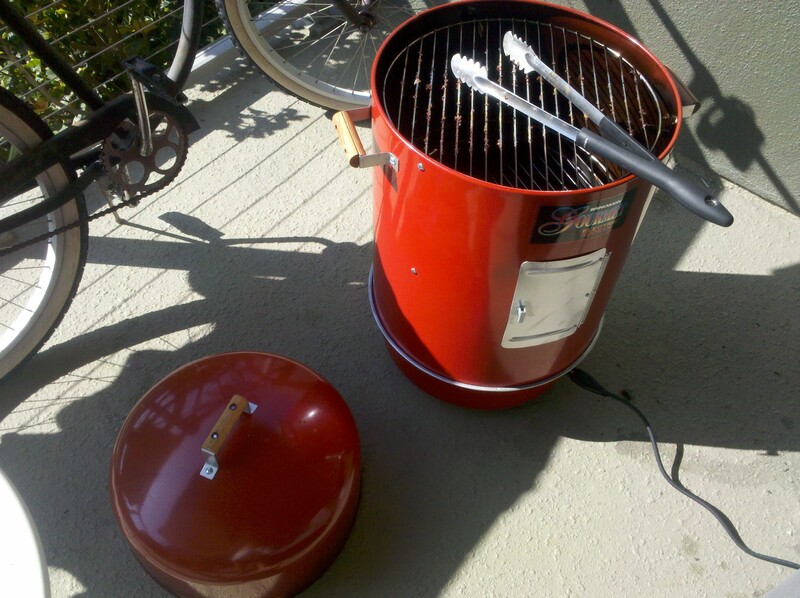 The pan should have a steel rack on it for the meat to sit on thus not be immersed in the drink. Cover tightly with tinfoil and into the oven for about three hours. 6.) Take her out of the oven, and let rest for 10 minutes uncovered to let juices distribute. 7.) We’re not out of the woods yet folks, because the last step is crucial: CARVING. Make sure you cut against the grain! There are guys that make a career out of cutting brisket properly, seriously – see Schwartz’ in Montreal or Katz in NYC. 8.) Ok, this is the fun part. Pile the nice thin slices of brisket on rye bread, two inches high, a dash of deli mustard (yeah, the light yellow stuff), and a Bubbies pickle on the side. Alex, Matt and I (along with a couple pass-er-by neighbors), almost put the entire brisket to bed. It was out of this world tasty, and did indeed, melt in your mouth. The smoked meat goal for this week is in the books. Let me know how yours turns out. Sounds like Schwartz’s South to me!